Today I had probably the greatest bit of pulls I'm going to have for some time. I finally mustered up enough guts to do my first video box break. 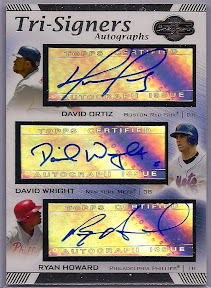 The box chosen was Topps Co-signers 07. When I bought the box I was a bit worried that all the good cards had been bought up. To my delight I was totally wrong. 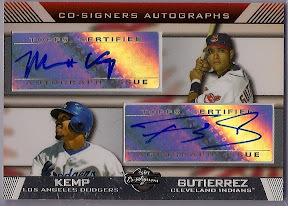 The box guarantees 3 autos with one of them being a co-signer. In addition the box guarantees 9 numbered parallels. Each pack contains 6 cards with 12 packs in a box. The cards looked great! Each card is somewhat mirrored much like Moments and Milestones. The parallels have 2 players, one is a mirror image and the other is a regular colored in picture. 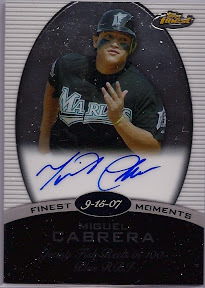 The First auto I pulled was a rookie parallel numbered to 125... Angel Sanchez. 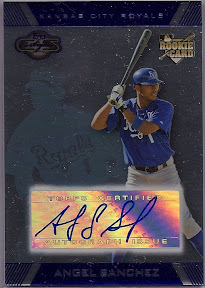 i don't know much about him but I plan to research this Kansas City Royal. 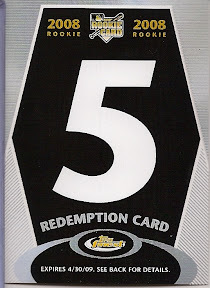 After that pull I figured that card was my "co-signer"...how wrong I was. I have to say that this set is my favorite so far. I am looking forward to a co-signer 08 friendly box break war with Mario from Wax Heaven that we are trying to set up. While I was waiting to do my box break I opened up a Topps Finest mini and got some exciting pulls. I don't know if you can see it well in the scans but it looks like somebody at Topps got a little "excited" with this card. One of the corners is bent, the ink is running, on the back it looks as it someone tried to stab a chunk out of it. I'm not upset about it but I got a really good laugh out of the whole thing. The best part of the card is a question on the back that reads "what is your favorite part of being a rip girl?" The answer... "having fun with the rip master and the other rip girls" HAHAHAHAHA my feeble 20 year old mind thinks that is priceless. Baseball card makers putting in half the effort? Just when I think I'm out, they drag me back in.